There are a lot of beautiful countries to visit and explore in Europe. I had been to some of these countries and I've even thought about looking for removals to relocate to some of them. I have some favorites. One of it is Italy. There are some cities and towns that I had already visited in this country and so far I love them all. I remember during my spring vacation last month where we stayed in one of the cheap villas in Italy in the region of Liguria. That place was so enchanting! Don't you know that Italy is also home to the greatest number of UNESCO World Heritage Sites in the world? No wonder, it is very famous worldwide not only for its interesting sights but also for its cuisine, beautiful beaches, trendy fashions, luxury cars and so many more. Here are some of the top five places I wish to visit in Italy. I am very happy and proud of myself after seeing this so-called "Eternal City". This capital city of Italy is truly a magnificent one especially its historical architecture of various kinds. With its beautiful palaces, old but historical churches, beautiful fountains, interesting and varied monuments, romantic ruins, Rome has become one of Europe's and the world's most visited and beautiful capitals worthy to see and experience. I had been there and I can attest it. I wish to visit this city again in the future. look whose striking a pose here? with Colosseum as the background. I love Rome! I envy some of my friends as they visited some of the famous cities in the Tuscany region in Italy last month. During that time, I was also gallivanting in Monaco, in the Ligurian region of Italy and French Riviera. My friend told me that they stayed in one of the beautiful Tuscany villas near a beach. 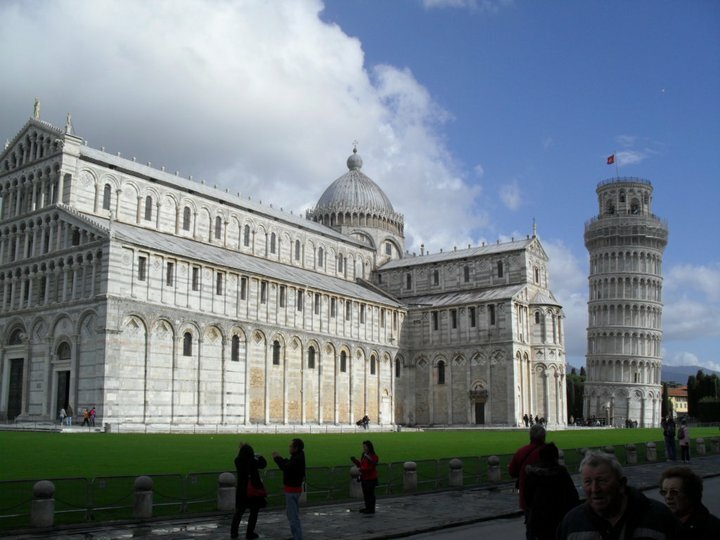 For sure, I would love to see the famous sight of Pisa, the world famous Leaning Tower. My friend reminded me not to miss the other architectural and interesting marvels of this beautiful city. Right now, I am still thinking whether to visit the Tuscany region in Italy or Turkey this summer season. I will see and will for sure share it here. the famous Leaning Tower of Pisa. taken by my friend. One of the beautiful cities I happened to visit twice last 2005 and 2006. This place is so lovely that I am organizing a trip here sometime in July this year. I just want my friends to visit and see Venice, which is considered to be one of the most interesting cities in the world. I love especially St. Mark's Square, a must to see when visiting Venice. This is where you can see the St. Mark's Basilica, a famous cathedral in this city. Do you know what is the main reason why I still want to go back there? I want to experience a gondola ride. This is the capital city of the Italian region of Tuscany. Florence was said to be the birthplace of the Italian Renaissance. This city has played a very important role in influencing Europe, politically, economically, and culturally. The famous philosopher Galileo and other scientists conducted first the study of optics, astronomy, anatomy, ballistics and many more in this city. I want to especially visit Santa Croce church, where Michelangelo, Machiavelli, Galileo's tombs and other notables are located. There are a lot of historical and interesting sights to see in this city. Watch it out when I am done visiting it. Napoli, as it is called in Italian is the capital of the Italian region Campania. Do you know why I included this in my top five list? Naples is very proud of its 448 historical and monumental churches which is so far the highest number in the World for a single city. It has one of the biggest historical city centre in the world, the very reason why it is included in the list of UNESCO World Heritage Sites.